By: Erik Hyrkas on December 16, 2017. 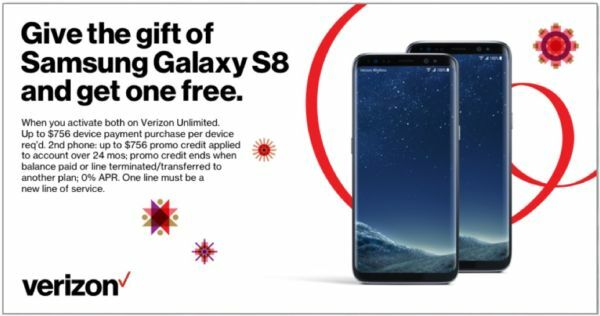 If you’re looking for that great tech gift, Verizon is offering some decent buy one get one (BOGO) free holiday deals on the Samsung Galaxy S8 and 8+, and Note8, as well as Apple’s iPhone 8 and 8 Plus. The deal launched this past Friday. Verizon is offering the deal if customers buy the two devices from the same manufacturer (no mix and match Android/iOS here), and activate a new line on Verizon’s unlimited plan. The deal will show up on the bill as a discount credit, covering the second device for two years. Of course, if you’re on a limited data plan and not looking to upgrade your monthly payment, the additional cost of unlimited (and the first new phone) may not make it a deal for everyone. Nevertheless, BOGO deals don’t get much better for flagship devices, and this could be a great way to jump start a family plan with brand new smartphones. Trade-ins aren’t necessary and the offer is available for those upgrading or switching. The fine print for the deal on the S8+ is below. 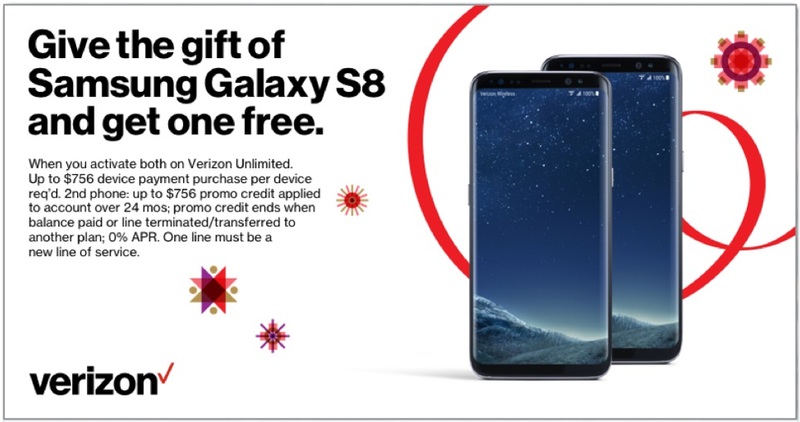 Up to $960 device payment purchase and Verizon unlimited per device required. 2nd phone: $756 promo credit applied to account over 24 mos; promo credit ends when balance paid or line terminated/transferred to another plan; 0% APR. One line must be a new line of service. First device can be any memory configuration of Galaxy S8, S8+, or Note8. Second device can be any Galaxy S8, S8+, or Note8 of equal or lesser value to first device, but devices other than the Galaxy S8 will not be free after $756 promo credit. Last updated by Erik Hyrkas at December 16, 2017 .